Cannot declare an attack unless you send 2 other cards you control to the GY. You can only use each of these effects of "Super Express Bullet Train" once per turn. ● If all monsters you control are EARTH Machines (min. 1): You can Special Summon this card from your hand. 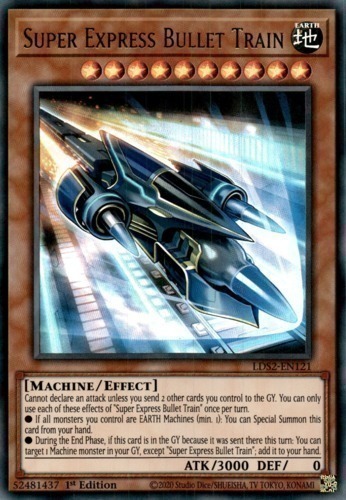 ● During the End Phase, if this card is in the GY because it was sent there this turn: You can target 1 Machine monster in your GY, except "Super Express Bullet Train"; add it to your hand.